Bernie’s Place could be any upscale full service restaurant and Devon could be one of hundreds of experienced full-time servers. But Bernie’s Place is a food service career training restaurant only 300 feet from the energetic McKenzie Center for Innovation and Technology of the MSD of Lawrence Township on the northeast side of Indianapolis; and Devon is a high school student learning to become a professional server. My company, Indianapolis-headquartered Schmidt Associates, an architectural and engineering firm, was selected to design, manage the project and oversee the renovation. The project was scheduled for an 18-month build out with a $4.3 million budget. The total project included the renovation creating the new dining and kitchen environment for Bernie’s Place, 7,800 square feet; Studio 75, 9,000 square feet and about 2,000 square feet for security corridor and other shared spaces. The Technology Center renovation was part of a 21 building district-wide $127 million Blue Ribbon Facilities Plan. A ceiling-mounted video camera captures food preparation techniques by culinary director Gracie Sahms demonstrating to students every detail on high definition video screens in the kitchen. On a normal day Bernie’s Place serves about 115 meals including take-out orders. On that same day, 70 cosmetology students across the hall might be giving hair styles, coloring hair, providing facials, pedicures and manicures to their customers, many of whom come from nearby community centers and a retirement center. Bernie’s Place, Studio 75 and the associated areas were especially challenging because we are required to provide professional quality restaurant and cosmetology facilities and assure a productive learning environment for high school students. The two areas’ curricula must meet all career and technology education standards. Both areas must meet standard city and state health, building and sanitation codes. Security – first and foremost – because Bernie’s Place and Studio 75 would have customers entering from the outside, security systems had to isolate the public spaces from the general school area. Create a teaching environment for the kitchen including internal video support. Create a professional and inviting environment for customers. “We depend on the community and the entry area has to be safe and comfortable,” said Svarckopf. The restaurant kitchen and dining area had to meet industrial standards including the structural layout. For example, the doors had to have the unique restaurant swing – one in, one out. The cosmetology area required special electrical service, ventilation, countertops and walls. The build out had to find creative cost efficiencies and reuse. For example, the Center and our team found and reused surplused athletic lockers. We also found major cost savings by prepping and repainting walls instead of using wall coverings. Customers and especially senior citizens had to have easy access to Bernie’s Place and Studio 75. But customers also had to be separated from normal school activities. “The timing and budget required close communication between our staff and the Schmidt Associates team,” Svarckopf remembers. “The Schmidt Associates team listened. In a typical conversation with our teachers, they would ask “What do you need? What do you want? What can we improve on?” He said the architects and school staff had many meetings in the construction trailer. 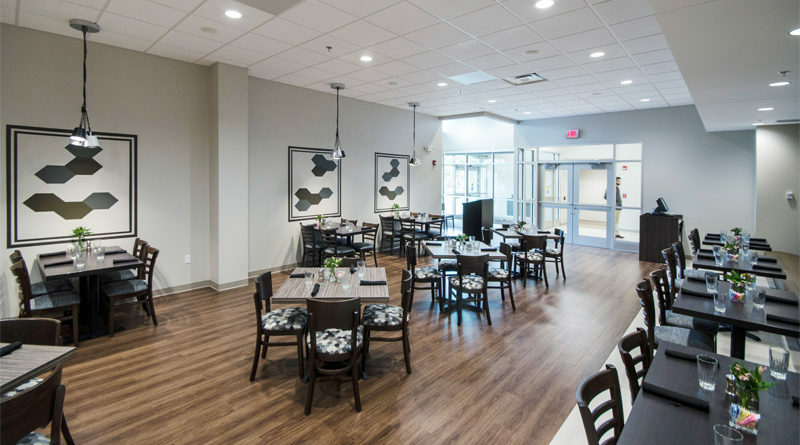 Interior design was crucial to blend modern restaurant design with Bernie’s Place customers in mind, and at the same time, be sensitive to security issues in a school. For Studio 75, a calming modern large-scale tree wall design is carried through the space. Svarckopf said the project was complicated because the restaurant had to continue to operate during the renovation. We recommended and implemented installing temporary walls and utilities while the new Bernie’s Place was constructed. We never missed a day of working in the old restaurant while converting to the new restaurant. Eighty percent of McKenzie Center for Innovation and Technology Innovation culinary and cosmetology students find jobs after graduation and stay in their career. Completion of the two year culinary program can lead to opportunities in food service in cafeterias, schools, hotels, fast-food plants, factories, clubs and restaurants. Some students continue to two and four year advanced education, and students can earn dual credits with IVYTech Community College and Vincennes University.